Gaza: They may not be able to leave Gaza without Israeli or Egyptian permission, but their photos can. The two women are among a small number of Instagram stars in the blockaded Palestinian enclave, showing followers a different side of their homeland from what much of the world may be used to hearing or seeing. “I see Instagram as a window,” says Kholoud Nassar, 26, wearing a pink hijab and fiddling with a toy car that features in many of her pictures. Both have more than 100,000 followers on the social platform and say they get recognised multiple times a day in the tiny territory that is home to two million people. In the enclave sealed off by Israel to the east and north, Egypt to the south and the Mediterranean Sea to the west, it is impossible for Gazans to leave without permission. Neither of the women has left Gaza in more than a decade. Israel also refuses to give permits for tourists to visit the strip, leaving most people outside to imagine life there. And after three brutal Israeli assaults, many people’s ideas of Gaza centre on devastation, poverty and suffering. The women use Instagram, with its focus on pictures over text and political arguments, to show another side. “War is a part of Gaza, but it is not all Gaza. I wanted to show there was more to Gaza — as in any country,” Nassar tells AFP in a cafe near the coast in Gaza City. Nassar’s pictures range from young children to harvests, all bathed in a range of colours, while Mosabah shows all sides of daily life. Both women feature heavily in their own pictures, with wide smiles. Mosabah agrees that the aim is to “change the perception of Gaza” away from political matters. A United Nations official recently said the strip may already be “unlivable”. Despite Gazans receiving only a few hours of electricity a day in recent months, social media outlets remain popular. Ali Bkheet, president of the Palestinian Social Media Club, estimates that around 50 per cent of Gazans have Facebook, though numbers on Instagram and Twitter are significantly smaller. He said the decade-long Israeli blockade had made Gazans particularly keen to use social media “to express ourselves and communicate our voice”. Nassar started before the last war in 2014 and documented the human toll of the conflict. 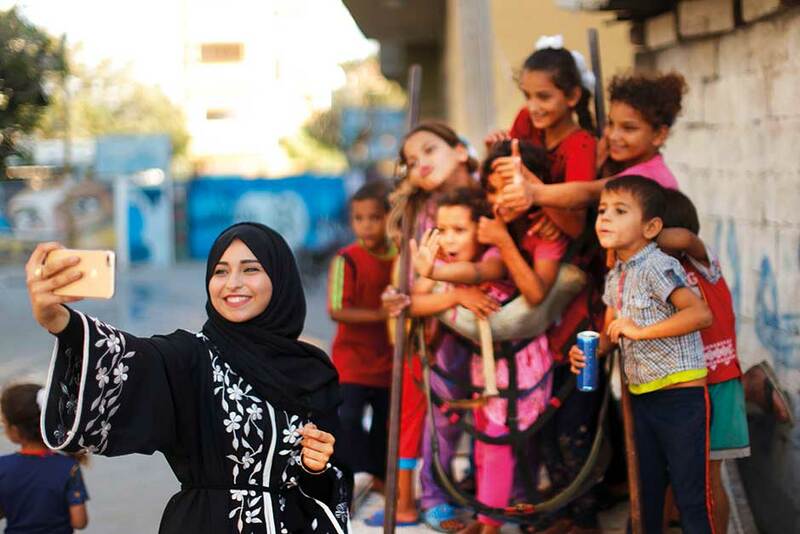 In the three years since, she has sought to focus on how Gazans struggle through terrible conditions — including creating a “trying to live” hashtag to show how people were putting their lives back together after the war. The toy car, an old Volkswagen Beetle Nassar carries in her bag at all times and which features in dozens of her photos, has become a trademark helping her connect with others. People from across the Arab world now send her pictures of the real cars, which she posts on her page. For Mosabah, Instagram is also a source of revenue — making between $300 (Dh1,101) and $400 a month from e-marketing and adverts on her page. In a region where 60 per cent of young people are unemployed and the average salary is a couple of hundred dollars, she has carved out a niche for herself.